These advanced plyometric exercises should be the next step if you feel like you have graduated from some of the more basic exercises listed on my other pages. The main goal with plyometric exercises is to perform a quick, yet strong contraction with your muscles. This rapid force generation is ideal for all types of athletes, including golfers. 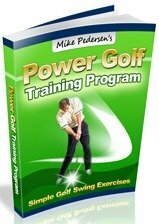 Even though golf does not involve running or jumping, training your muscles for the fast twitch action of the golf swing will help you generate more torque and club head speed, in addition to providing you with a more stable base. These plyometric drills are not for beginners! If you have never performed plyometrics before, please refer to my other pages for some more basic exercises as an introduction. If you are unsure or unfamiliar with what you are doing, please shy away from this type of exercise because serious injuries could result. -Start standing, with your feet shoulder width apart. -Perform a small squat and then burst upward into the air, lifting your knees up to your chest. -Land soft by absorbing the impact of landing with your knees, and quickly jump back into the air. -Start with sets of 10 reps and progress from there. -Stand with feet, at most, shoulder width apart. -Jump into the air and spin (hopefully) 360 degrees), landing in the same position you started in. -180 degree jumps can be substituted initially if 360s are too challenging. -Perform 5-10 reps clockwise and then counter clockwise. 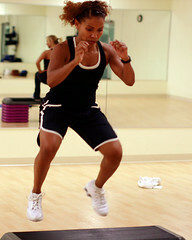 -One of the more traditional plyometric exercises, begin standing facing a box or exercise bench. A sturdy piece of furniture like a large ottoman or low bed could be substituted as well. A height 12 inches or greater would be preferred. -With a quick burst, jump onto the box, landing softly by bending your knees at impact. Can be performed as a super set with jump downs. -Opposite of the high jumps, start by standing on the box or bench and perform a small jump off. -At impact with the ground, absorb your momentum by going into a deep squat and then stand straight. -Also, when you land, make sure that your knees are in alignment with your feet, and not pointing inward. -Step back up to the box and repeat. Can be performed as a super set with high box jumps. -A great calf workout! Stand in an open doorway, with your hands raised overhead. -Perform quick, small jumps, tapping the top of the door frame with your hands as fast as you can. -Try to keep on the balls of your feet, as most of the force generation with this exercise will come from your calves. -20-30 reps at a time should be enough to get a good burn, as the reps go pretty quickly.